Anthony Hopkins has painted and drawn all his life and exhibits regularly in Sydney and New York. ‘He sees and feels lights and colour in his head, translating them into organic shapes that ultimately become luminous works of art on paper,’ says Jenny Sages. Born in Shanghai, Sages arrived in Australia in 1948. She studied at East Sydney Technical College, the Franklin School of Art in New York, then with John Olsen and Mary White. After freelancing as an illustrator for nearly 30 years, she has painted full time since 1985 and has exhibited her work in numerous solo and group shows. Sages has been a finalist in the Archibald Prize on 12 previous occasions and was highly commended in 1995, 2000, 2001 and 2003. 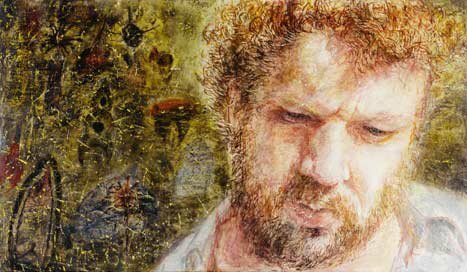 She has won numerous art prizes including The Portia Geach Memorial Award for portraiture in 1992 and 1994 and the Mosman Art Prize in 1994. She was also highly commended in the 1999 Wynne Prize. Her work is represented in many public and private collections including the National Portrait Gallery.